King Alfonso XIII, just after the turn of the 20th. century, established a royal hunt in the area and wanted a hunting lodge and inn. Nearby is the Gredos circle of mountains.These fertile awe-inspiring mountains and lowlands are a mysterious blend of history, geography, and capricious weather. Sometimes pleasant and sometimes inclement, it is frequently harsh. 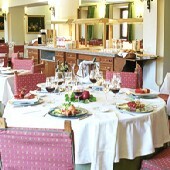 Here you get the Parador experience and atmosphere. Its location on El Alto del Risquillo, gives views of the Tormes valley, the Gredos massif and the Piedrahita and Bejar mountain ranges. The sturdy stone walls conceal an interior in which the comfortable bedrooms, some with terraces, are found. 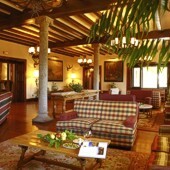 Wood prevails in the main rooms while granite columns and the furniture offer a traditional style of Castile. The famous bean dish of the region is called "Judias del Barco" beans. The quality of the veal chops is outstanding and the area is well known for its roast meats including suckling pig. The fresh mountain trout should also be tried. In 1978, the final draft of the then new Spanish Constitution was finalsed here, in the not so aptly named 'Silence Room'. A signed copy of this document is displayed for visitors to see. Walking, mountain biking, riding, fishing, climbing are some of the activities you may do at many natural locations nearby such as Plataforma, Laguna Grande, Cinco Lagunas, Puerto del Pico, Cuevas del Aguila, and the valleys of Tietar and Jerte. It is an area with many ancient sites and traces of prehistoric civilisations. 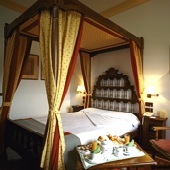 The Gredos Parador has fifty six twin bedded rooms, fourteen rooms with a double bed and four suites. All rooms have a private bathroom and also a telephone, satellite television, safe and a mini bar. There is air conditioning and central heating, a restaurant and bar, currency exchange, cable television, parking facilities (without security and limited places), lift and a gift shop. Facilities are available for meetings and for the disabled. The Parador of Gredos has a tennis court and in the garden there is a children's play area but no swimming pool. Distance from the nearest airport is approximately 170 kms and the nearest train station is 60 kms away. Sadly we did not enjoy our experience at the Parador de Gredos. Having previously spent 2 glorious nights at the sumptuous, friendly Parador at Oropesa we were most disappointed by Gredos. Our first impression was of having arrived at a ski chalet, complete with an utterly unhelpful receptionist. We had reserved a suite as a birthday treat but were utterly underwhelmed – small lounge area with tired sagging furniture, tiny bedroom with a narrow 4-poster. How we regretted leaving the sumptuous grandeur of Oropsea. To boot, our room overlooked the busy, noisy parking area at the road-side front of the hotel. We asked the receptionist if we could possibly change rooms – but she was absolutely disinterested offering no alternatives. The restaurant is essentially a huge canteen – 4 small windows overlooking the wooded mountains and sparse decoration – again we dreamt of the magnificent views form the restaurant at Oropesa. Service was mainly efficient but distinctly nonplussed – we attempted to reserve one of the 4 ‘window’ tables on both nights – our reservation was taken – but each time our reserved tables had been given to other clients. The food was mainly average and often tasteless: bland timbale, tough grisly veal, tasteless sorbet – the only redeeming dish was grilled salmon. Location wise the Parador is literally in the middle of nowhere. To conclude, having stayed at many excellent Paradors overt he past 10 years – this has definitely been the most disappointing on all levels – we shall not return. Our first stay in one of the famed Paradores was a great experience. A wonderful hotel in a beautiful setting, very comfortable, good food and friendly staff. Unfortunately we only stayed one night but would certainly come back to Gredos as it is a very beautiful part of Spain. Our only complaint was the lack of air conditioning & being housed on the top floor made it an uncomfortable night. We did notice the floors below were cooler, so choose these if you visit in the height of Summer. We enjoyed our visit at the Gredos parador . Staff was very welcoming and helpfull . A wonderfull building , with respect to the old architecture and furniture ( eg nice authentic doors) Breakfast and dinner was OK. Rooms were confortable and clean . We did a very nice mountain stroll in the neighbourhood accompagned by some goats . This was our first stay at a Paradore and we highly praise Gredos Paradore. Finding it couldn't have been easier! (literally on the main road)! The atmosphere throughout the public areas of the Paradore, in different sitting rooms and views , keep an authentic feeling of an almost hundred year old hunting lodge. The bedroom had amenities and modern facilities and the bed was comfortable. There was no noise to disturb us and the staff was pleasant. The Gredos platform was close by and quite impressive as was the entire area. We were overwhelmed with the beauty of the mountains, with blooming yellow fiorino and stunned by their fabulous aroma! 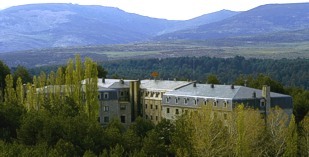 Parador de Gredos near Avila was the first Parador. It has views of the mountains and river valley.